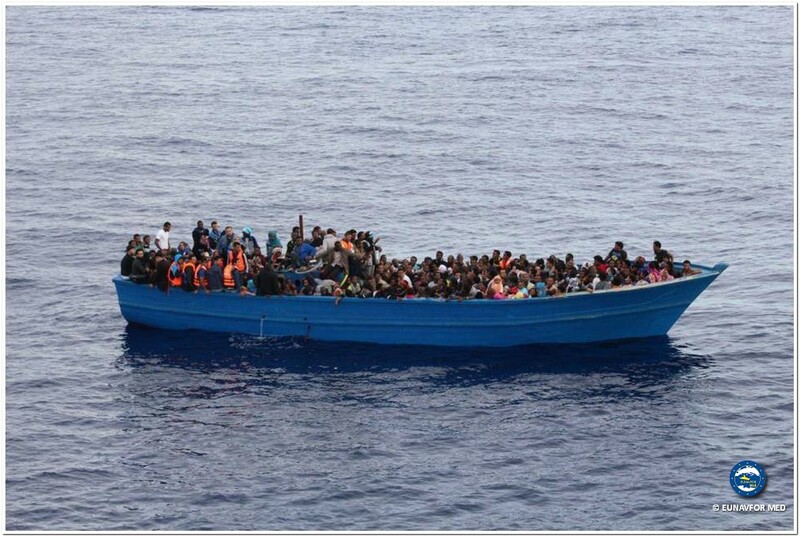 Mode of transportation across the Mediterranean pictured during rescue. Source: http://bit.ly/2Dj25Ti. The number of migrants attempting to migrate to Europe via the Mediterranean reached epic proportions after the famed Arab Spring rose to a fever pitch in 2011. Public protests turned violent, and in Libya’s case, led to the US-backed assassination of authoritarian leader Muamar Gaddafi. After the end of forty-two years of iron-fisted rule under the dictator, Libyan citizens were hopeful for the political future of the country. This hope, however, faded quickly. An interim government composed of military factions failed to uphold its promises or maintain unity between each group, vying for control of key cities like Benghazi, Sabratha, and the country’s capital, Tripoli. The UN-backed administration, the Government of National Accord (GNA), currently under prime minister Fayez al-Sarraj, has control of Tripoli and Sirte. Much of the east is controlled by the Libyan National army under military officer General Khalifa Haftar. Haftar participated in the coup allowing Gaddaffi to seize power in 1969 and subesequently earned a position in the administration until he fell from Gaddafi’s favour and was driven out of Libya in the late 1980s. Haftar, although originally cooperating with the United Nations GNA, claimed that its mandate stipulating cooperation expired last month. Atop political turmoil, persistent conflict and economic collapse promote insecurity throughout the country. Without a unified government capable of imposing order, migration and trafficking have ballooned out of control. At the same time, thousands of people fleeing conflict in countries like Nigeria, Syria, and Sudan began taking advantage of the Libyan coast’s proximity to Italy. In 2015 alone, over one million migrants crossed the Mediterranean according to the International Organization for Migration (IOM). The Mediterranean migration route is known as “the deadliest in the world” with over 33,000 deaths recorded between 2000 and 2017. In 2016, 7,927 migrants died or went missing worldwide, with 5,143 of those deaths occurring in the Mediterranean alone. Within the first week of January 2016, 1,100 migrants crossed the Mediterranean and 12 were reported dead. This year, around 1,400 migrants crossed the Mediterranean and at least 192 were reported dead. At least 76 of those deaths were recorded between Libya and Italy and over 700 others were rescued or intercepted by the Libyan Coast Guard. Any migrant boats intercepted within twelve nautical miles of the Libyan border are within Libya’s “territorial sea”. Therefore, these migrants are automatically sent back to Libya. Those who make it past this point reside in international waters and are protected under international maritime and refugee laws. Therefore, they are taken to “a coastal State in the immediate vicinity of the rescue” or, in some circumstances, “where it is clear that those rescued intended to request asylum from the flag State”. International waters are inhabited by countries’ naval forces and international non-governmental organizations (NGOs) whose sole purpose is responding to and rescuing migrants. These combined efforts have proven fruitful, saving 800 people in one week in November alone. The collaborative naval presence also uncovered what was referred to as irresponsible conduct of the Libyan coast guard despite tens of millions of dollars worth of training by the EU. In September, a German NGO alleged that Libyan forces shot near a rescue boat and demanded they take migrants boarded on the ship. Sea Watch, an NGO involved with a rescue mission in November, claimed that the Libyan forces ignored coordination efforts between the NGO and naval boats, did little to aid migrants, and even went as far as beating those who entered the boat and throwing potatoes at the quickly deflating dinghy carrying the migrants. Since the 2015 peak in migration, the EU and NATO took hard line measures to deter migration, increasing air and sea surveillance in the Mediterranean, signing agreements to stem irregular flows of migration from Turkey, and engaging in profiling and border closures in some countries. Further, Italy is investing millions of dollars over the next five years training and equipping the Libyan coastguard. Thus far, these efforts seem to be working with a lull in migration compared to the past two years. However, human rights groups have decried these actions for several reasons, including trafficking and abuse. Human rights groups argue that there are a host of possible reasons for the reduction in migration numbers that may or may not be related to the very efforts made by Italy and the EU. Less oceanic migration, in fact, could be related to heightened domestic smuggling and slave trade within Libya, meaning efforts to quell migration into continental Europe may actively promote human rights abuses. This also highlights the issue that warring military factions within the country do not follow conventional law by trafficking migrants. Despite this, these groups continue to negotiate with governments and international organizations. Reports from aid organizations like the United Nations Refugee Agency (UNHCR) offer insight into the living conditions to which many migrants in Libya are subjected. For example, some migrants find official detention centers where humanitarian organizations have access. Others end up in the hands of one of the many militias operating within the country. Militias control human trafficking and trade, thus subjecting migrants to abuse, forced labor, and extortion. Sabratha is known as one of Libya’s most active trafficking centers. There, rival militias clashed over a period of several months eventually ousting the incumbent group. When the violence subsided, international organizations like the UNHCR came to the aid of what turned out to be over 20,000 migrants imprisoned there. In Sabratha, migrants were packed in warehouses, farms, and houses. There, they were under the control of militia “Bosses” who told them when they could eat, where they could sleep, what labour they would be forced into, and how much they must pay for freedom or to prevent violent abuse. In fact, “[m]ost of them say that they were subjected to numerous human rights abuses, including sexual and gender-based violence, forced labour and sexual exploitation”. Not all migrants who went through Sabratha remained there, however. Some were transferred to “prisons” in other coastal cities where they remained for weeks in similarly deplorable conditions before setting out to cross the Mediterranean. The extent of the abuse came into the international spotlight this fall. In November, CNN released a video of African migrants being auctioned off as slaves. This video sparked outrage over the recent efforts of the EU to curb migration over the Mediterranean. Many saw the video as proof that EU migration policies promote modern day slave trade. Further compounding the issue were arguments that these policies disproportionately affect Black Africans. Although the migration crisis is below 2015 peak levels, the lives of those fleeing their homes and searching for safety remain tenuous. The past months alone revealed incredible human rights abuses at the hands of Libyan traffickers. Moreover, those facing forced labour and violence are the very same who fled abhorrent conditions in their home countries in search of a better life. Those who do manage to make it to sea must face the deadliest route in the world. If the international community claims to advocate for human rights, then those rights should extend to all, including migrants.